The cast of Ang Larawan. The film is both a symbol and allegory on the passing away of good old virtues. 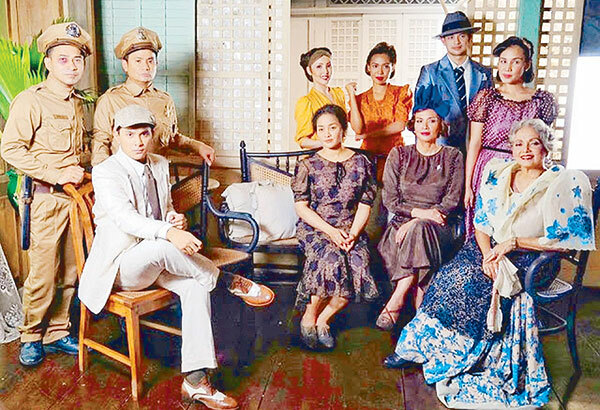 MANILA, Philippines — Ang Larawan — the musical based on Nick Joaquin’s play A Portrait of the Artist as Filipino ­— has many things going for it. For this viewer, the film is a good introduction to the powerful, if, well-nuanced libretto of Rolando Tinio (now National Artist for Theater) and provides an excellent sampling of the sound of the ABS-CBN Philharmonic Orchestra under the baton of Gerard Salonga. The orchestra ­— which accompanied the singers and interpreted Ryan Cayabyab’s haunting musical score ­— was a highly-inspiring presence in the film. In terms of intrinsic film realism, it was the performance of Sandino Martin (as Bitoy), Paulo Avelino (as Mr. Javier), Nonie Buencamino (as Manolo), Menchu Lauchengco-Yulo as Pepang, Cris Villonco as Susan and Robert Arevalo as Don Perico who registered very well on the screen. Their contrasting, if, evenly layered characterizations were perfect foil for the financially distraught Marasigan sisters played well by Joanna Ampil and Rachel Alejandro. They, however, looked quite young for the part. Their costume and make-up ­— making them look a few years older — would probably be better appreciated in the stage version but tended to look quite contrived on film. The singing of Rachel and Joanna along with Celeste Legazpi (Doña Loleng) was on the whole commendable but the late, if, brief appearance of Doña Upeng played by Dulce was deeply felt with her natural acting and spectacular singing. That moment was like hearing her sing Memory from Cats and Bali Hai from South Pacific all over again. But on the whole, Ang Larawan is worth watching if only to remind us that there is dignity in the nurturing of the arts which are still looked down as immaterial to national progress. The sight of the great painter’s daughters woefully coping with bills is a reflection on how artists still live today. And to even consider catching rats and giving piano lessons to survive is the supreme irony and tragedy of the Filipino artists. As it is, Ang Larawan is both a symbol and an allegory of the overpowering evil of materialism and with it the quiet, if, unheralded passing away of old world virtues. Nonie Buencamino (left) with Menchu Lauchengco in Ang Larawan. Closer ties with family. Nonie, who plays the older brother Manolo who wanted to sell the ancestral house for a lucrative price, said he is the opposite of his role in Ang Larawan. Directed by Loi Arcenas, Ang Larawan ­— where Nonie plays the materialistic big brother — opens on Christmas Day. It also stars Aicelle Santos, Cara Manglapus, Jojit Lorenzo, with the special participation of Ogie Alcasid, Rayver Cruz, Zsa Zsa Padilla, Bernardo Bernardo, Jaime Fabregas, Noel Trinidad and Nanette Inventor, among others.